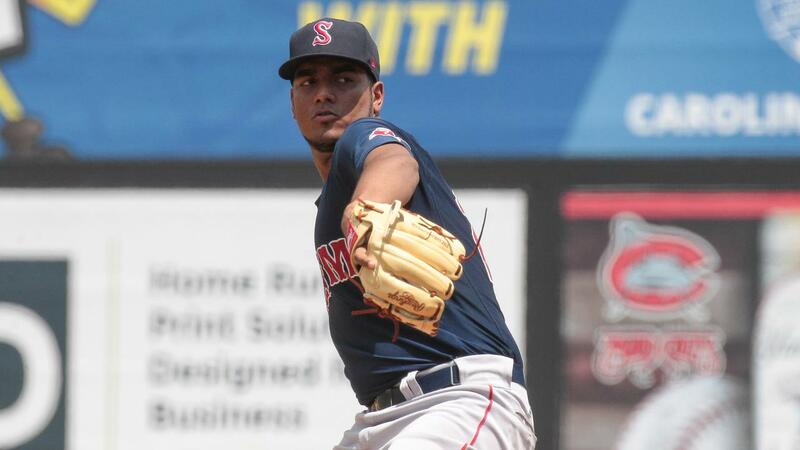 WINSTON-SALEM, NC (Tuesday, August 28) - Salem Red Sox pitcher Denyi Reyes was named the South Atlantic League's 2018 Most Outstanding Pitcher on Tuesday, honoring the fantastic season he had with the Greenville Drive before his promotion to Salem. Reyes, 21, dominated for the Drive from April through July, earning a 10-3 record with a 1.89 ERA and .201 batting average against in 123.2 innings pitched across 21 games (18 games started). The Dominican-born righty struck out 122 batters while allowing just 92 hits and 13 walks for a staggering 0.85 WHIP (Walks + Hits per Innings Pitched). Over the months of May, June and July (which comprised his last 16 games for Greenville), Reyes went 8-2 with a 1.59 ERA and a .189 batting average against, fanning 94 while allowing 70 hits and 11 walks in 102 innings (0.79 WHIP). He previously was named Minor League Baseball's SAL Player of the Month for July, when he went 4-0 with a 1.85 ERA in five starts. Since joining Salem, Reyes has gone 2-2 with a 2.66 ERA in his first four starts, whiffing 18 batters in 23.2 innings while allowing 20 hits and just three walks. His career strikeout-to-walk ratio of 9.37 has raised eyebrows among fans and players alike, with even the vaunted Boston Red Sox rotation taking notice. Reyes is in his fourth professional season, and has gone 32-7 as a pro with a 2.14 ERA in 319 innings. This marks the first time any Red Sox farmhand has won Most Outstanding Pitcher or Most Valuable Player at any full-season since Anthony Ranaudo (Triple-A International League) and Henry Owens (Double-A Eastern League) each won Pitcher of the Year Honors in 2014. Reyes takes the ball for Salem in their game against the Winston-Salem Dash Tuesday night. First pitch from BB&T Ballpark is scheduled for 7:00 p.m., and the pregame show with Ben Gellman and Suzie Cool begins at 6:45 p.m. on the Red Sox broadcast network.